For many students, college is synonymous with debt and financial stress—and it shouldn’t have to be. This article was originally published by the Institute for Policy Studies website. If lawmakers can’t come up with a solution, interest rates on federal student loans are set to double from 3.4 percent to 6.8 percent starting July 1. When I graduate from college in December, I will join the 37 million Americans with student loan debt. For me, college has always been synonymous with financial stress. I have spent the last three years on financial aid, scrambling to finish all of my credits in order to graduate early and save on a semester of tuition at my university. If the interest rate on my Stafford loan doubles, I will have to continue to put my dream of law school on hold. The fear of sealing myself into a tomb of debt will prevent me from seizing opportunities at the time in my life when I am supposed to be taking risks. The number of students and the price of college continue to rise every year. It shouldn’t come as a surprise that not only are more people taking out student loans, but they are also taking out more money. The average student loan balance increased by 49 percent between 2005 and 2012, and more than half of borrowers took out over $10,000 in loans. Total student loan debt is increasing at a rate of about $2,853.88 per second and it is approaching $1.1 trillion. In the last ten years, this number has nearly quadrupled and has already surpassed credit card debt and auto loan debt. Of particular concern is the effect on women. According to the American Association of University Women (AAUW)’s study “Graduating to a Pay Gap,” 20 percent of women—compared with 15 percent of men—use more than 15 percent of their take-home salaries to pay off educational debt. This is directly related to the fact that women earn only 82 cents to every dollar that a man earns. The plan proposed by Senator Elizabeth Warren (D-MA), “The Bank on Students Loan Fairness Act,” would allow students to borrow money at the same rate that banks borrow: 0.75 percent. House Republicans passed “The Smarter Solutions for Students Act,” which would increase the rate to an even higher percent than if nothing is done before July 1, based on market rates and fluctuations. In President Obama’s plan, called “Pay as You Earn,” loans would also vary depending on the economy, though it would allow low-income borrowers to cap their monthly loan payments to 10 percent of their income. Among others offering solutions are Senators Jack Reed (D-RI) ,Tom Harkin (D-IA), Harry Reid (D-NV), amd Kirsten Gillibrand (D-NY), and Representative Joe Courtney (D-CT). There are lots of ideas but one thing is clear: inaction is not an option. 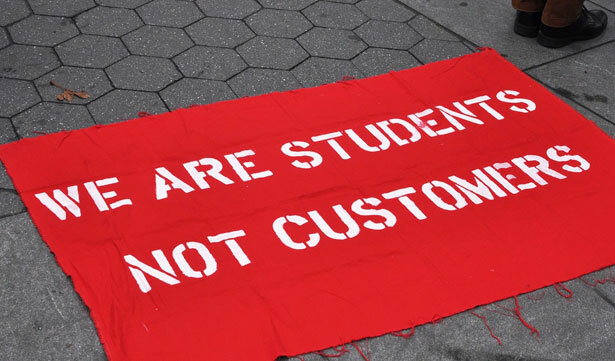 Doubling interest rates on student loans is not an option. Currently, 35 percent of people under 30 and 32 percent of those between the ages of 30 and 49 are near default on their student loans, numbers that will only continue to grow unless something is done. Recent graduates and current students like me have worked hard enough to hear messages of support and encouragement from our lawmakers—not that we are being forgotten about and taken advantage of. When I walk across the stage and receive my diploma this December, I want to feel that the sky’s the limit as it relates to my opportunities, not my debt. Alina ButarevaAlina Butareva is an intern at the Institute for Policy Studies and a rising senior at Tufts University.